Graham Reed, BSc, PhD, FIET, CEng, is Professor of Silicon Photonics at the University of Southampton, UK. In April 2012, he joined Southampton from the University of Surrey, where he was Professor of Optoelectronics, and was Head of the Department of Electronic Engineering from 2006 to 2012. Reed is a pioneer in the field of Silicon Photonics, and acknowledged as the individual who initiated the research field in the UK. He established the Silicon Photonics Research Group at the University of Surrey in 1989. The first Silicon Photonics company in the world, Bookham Technology Inc., was founded by Reed’s PhD student, Dr Andrew Rickman, and adopted the research developed in the Group. Bookham (now renamed Oclaro Inc) is one of the leading optical sub-system companies in the world. Reed’s Silicon Photonics Group have provided a series of world leading results since its inception, and are particularly well known for their work on silicon optical modulators. For example, the Group produced the first published design of an optical modulator with a bandwidth exceeding 1 GHz, and were the first to publish the design of a depletion mode optical modulator, which is now a technology standard device. More recently the team were responsible for the first all-silicon optical modulator operating at 40Gb/s with a high extinction ratio (10dB), as well as a second modulator design (also operating at 40Gb/s) that operates close to polarization independence. They also reported the first device operating at 50Gb/s. Reed is a regular invited and contributing author to the major Silicon Photonics conferences around the world. He has served on numerous international conference committees, and has also chaired many others. To name but two, he has been co-chair, of the Silicon Photonics symposium at SPIE Photonics West conference in San Francisco since it was first established in 2006, and in 2011 he was co-chair of the most prestigious Silicon Photonics conference, IEEE Group IV Photonics, held at the Royal Society in London, the latter being the most well supported conference in the history of the event. He is currently a member of 5 international conference committees, and has published over 300 papers in the field of Silicon Photonics. In 2013 he was the recipient of the IET Crompton Medal for Achievement in Energy, for his work on Silicon Photonics, and in 2014 he was awarded a Royal Society Wolfson Merit Award. He currently leads the £6.2M (approx. $10M) “Silicon Photonics for Future Systems” programme, a UK research programme funded by the EPSRC, as well as the £3.3M ($5.4M) “CORNERSTONE” project (also EPSRC funded), as well as several smaller. Goran Mashanovich completed primary and secondary education in the city of Valjevo, Serbia. He received BSc and MSc degrees from the University of Belgrade, Serbia and PhD in Silicon Photonics from the University of Surrey, UK. In 2008, he was awarded a Royal Society Research Fellowship to work in a new research field in the UK, that of Mid-Infrared Silicon Photonics. He joined the Optoelectronics Research Centre at the University of Southampton in 2012 where he leads research on mid-IR group IV photonics. His research interests include silicon and germanium photonic circuits, high speed transceivers, sensors, integration and packaging. He is author of 280 publications, including 7 book chapters. Prof. Mashanovich’s research income to date is in excess of £20 million (£2m as Principal Investigator). He is a member of several international conference programme committees and also a visiting professor at the University of Belgrade. Goran is very interested in innovative teaching and he has received several teaching awards. His main hobbies are tennis and photography. David is a Royal Society University Research Fellow and Principal Research Fellow within the Silicon Photonics group of the Optoelectronics Research Centre. 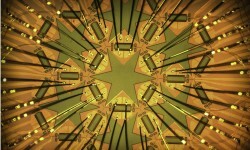 David leads research in the area of photonics for computing systems. His career in Photonics began with a year in industry at Nortel Networks in Paignton. David joined the University of Surrey in 2001 as an undergraduate student studying electronic engineering. He subsequently undertook PhD studies under the guidance of Professor Graham Reed investigating optical switching devices in silicon. From 2008 he worked as a research fellow in the same research group on a number of projects and different optical devices in silicon although focusing mainly on high speed active devices and their integration with other photonic and electronic devices. David moved to the University of Southampton in 2012 David taking up the role of senior research fellow. David has published over 40 journal papers, 10 patent applications and around 100 conference papers in the area of silicon photonics. David has served on 4 conference committees including IEEE Group IV Photonics and SPIE Photonics West. Dr Frederic Gardes is a senior lecturer at the ORC and he heads research on group IV material epitaxy and hetero-integration for photonic and electronic devices and systems. 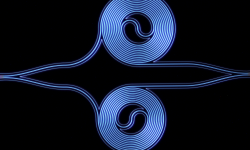 Fred’s previous research covers Si photonics and in particular high-speed active optical devices in Si and Ge. In 2005 he initiated work on Si optical depletion modulators and was the first to predict operation above 40GHz. In 2011 FYG and his collaborators demonstrated optical modulation in Si of up 50 Gb/s and a 40Gb/s modulator. Dr Gardes’ recent work focuses on tuneable crystalline SiGe on insulator for photonic and electronic devices and includes the first ever demonstration of multiple crystalline SiGe on insulator wire of different concentration on a single chip using a single deposition process. He is a member of several international conference programme committee, he is a project expert reviewer for the EC, and has authored more than 130 publications, 5 book chapters and 6 patents. Dr Callum Littlejohns completed his PhD in the field of Silicon Photonics at the Optoelectronics Research Centre, University of Southampton in March 2015, having previously obtained a First-Class Honours degree in Electronic Engineering at the University of Surrey. He is now part of the CORNERSTONE team in the Silicon Photonics Group at the University of Southampton, working on rapid prototyping of silicon photonics devices. He has a track record of excellence, having received multiple awards throughout his academic life, including the Information Overload category winner at the 2015 EPSRC ICT Pioneers Awards. Callum has published a book chapter, over 25 papers in peer-reviewed journals, and over 80 international conference papers, including a prestigious post-deadline paper at the 2014 IEEE Group IV Photonics conference, in the field of silicon photonics. The work completed during Callum’s PhD has been protected by two separate patents, both fully supported by the University of Southampton. He has twice served as the conference chairman at the Enlighten conference as part of the Photonex Europe exhibition. Dr Mehdi Banakar’s role in the CORNERSTONE team is a Senior R&D manager. Mehdi received his bachelor’s degree in 2005 and a Master’s degree with distinction from The University of Southampton in 2008. His PhD at The University of Southampton was in “Sub-micron texturing for photovoltaic antireflection and light-trapping”. He has explored 3 novel anti-reflection schemes based on sub-micron scale texturing of silicon and received his degree in 2015. He has a strong background in semiconductor devices, extensive experience with micro/nanofabrication processes. Mehdi joined The Silicon Photonic Group at The University of Southampton in July 2015 to explore optical modulation/detection and integration. Han Du received his BS degree from Shanghai Jiao Tong University (SJTU) in 2012 and his PhD degree from University of Singapore (NUS) in 2016, respectively. Currently he is working as Research Fellow in the silicon-photonics group at Optoelectronics Research Centre (ORC), University of Southampton. His research areas include silicon photonic devices, optomechanics, MEMS/NEMS, etc. 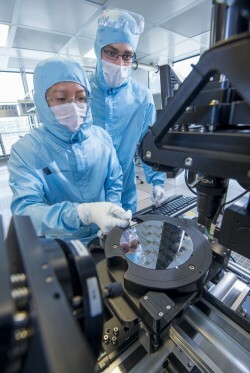 Han is special in fabrication of micro/nano silicon photonic devices. He has authored and co-authored over 10 journal and conference papers. Xingzhao Yan received his B.Eng. in Telecommunication Engineering from the School of Computer Science and Electronic Engineering, University of Essex and M.Sc. in Nanoelectronics and Nanotechnology from the School of Electronics and Computer Sciences, Faculty of Physical Sciences and Engineering, University of Southampton. From 2013 to 2017, he was working towards to his PhD in rare-earth-doped solid-state nanowire waveguide lasers with intensive cleanroom working experience. He joined the CORNERSTONE team in July 2017. Jonathan joined the Surrey Ion Beam Centre as Professor of Ion Implantation Technology in March 2017 after spending 25 years in the semiconductor equipment industry, 21 of those in ion implantation with Applied Materials and Varian Semiconductor Associates. He held senior management positions in the UK and USA leading the technical development of implantation equipment and collaborated with universities and companies in USA, China, Korea, Australia, Europe and UK in research on implantation based processing of advanced memory devices, ultra-shallow transistor junctions, solar cells and solar glass. He holds over 30 granted US patents in the field of ion implantation. Jonathan has been an industrial mentor for the Surrey University Ion Beam Centre Steering Committee, European SPIRIT Programme (Support of Public and Industrial Research using Ion Beam Technology), and the “Amorphous Chalcogenide-Based Optoelectronic Platform for Next Generation Optoelectronic Technologies” with Surrey, Southampton and Cambridge Universities. After obtaining his degrees in physics and nuclear physics at the University of Manchester, Jonathan spent his early career working with ion beams in isotope mass spectrometry at Vacuum Generators and then Columbia University. Roger joined the Department in 1983 as a Research Fellow with the SRC (as it was then - interesting how the EPSRC has gained letters over the years) Surrey Ion Beam Centre. He was employed to look after the computing facilities associated with the research group - a single pdp11, about half of the computer "power" in the department in those days. Engineering Department of the University of Salford, on the Mathematical Modelling of Atomic Collisions in Solids. He was made a Lecturer in the Department in 1986, promoted to Senior Lecturer in 1993 and then to Reader in 1997, reaching the dizzy heights of Professor of Ion Beam Physics in 2002. He is the current Director of the Surrey Ion Beam Centre. He has performed research at Penn State College and the Chinese University of Hong Kong.